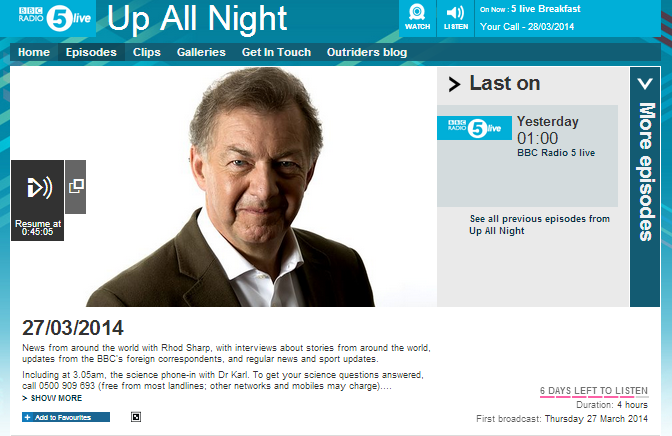 On March 27th BBC Radio 5 live’s late night show ‘Up All Night’ featured an item with the BBC’s Jerusalem Bureau’s Yolande Knell. The programme can be heard here for a limited period of time and the relevant section begins from around 37:15. Kerry of course flew to Amman in Jordan – not to Israel. “He broke away from this trip – President Obama’s talks in Europe on the crisis in the Ukraine. I think the fact he’s done this just underscores the seriousness of the threat to the peace talks that he sees. Ahm…the peace talks of course going on between Israel and the Palestinians – a process in which he has invested so much energy already – and so what he did, he broke away…ahm…and came to Amman just yesterday and he is supposed to have had talks last night – after having a meeting with the King of Jordan – with the Palestinian President Mahmoud Abbas. We were told he was going to have a working dinner with him and he was supposed to speak to the Israeli Prime Minister Benjamin Netanyahu by video conference or by phone as well. Knell makes no effort to inform listeners that the prisoner releases were from the very beginning tied to progress in the talks – which she admits has not been forthcoming. Neither of course does she bother to mention the incitement and glorification of terrorism which was seen during the Palestinian Authority organised celebrations of the three previous tranches or the cash hand-outs awarded to the released terrorists. Knell’s promotion of the notion of terrorists convicted in a court of law as ‘heroes’ is of course not new: such portrayal was a hallmark of her reporting of previous prisoner releases and is part and parcel of the BBC’s policy of presentation of a morally equivalent view of terrorism – in some parts of the world. In other words, audiences are herded towards the view that Palestinian incitement and glorification of terrorism does not “undermine the peace talks”, whereas Israeli building tenders most certainly do. Notably too, Knell completely neglects to inform listeners of the PA’s demand that in this particular tranche, Israel release convicted terrorists who are not residents of Palestinian controlled areas, but Israeli citizens. Knell’s reply includes further promotion of the PA narrative through – inter alia – use of the offensive term “Judaisation of Jerusalem” and the depiction of Arab Israelis as “1948 Palestinians”. Knell makes no effort to explain to listeners that Palestinian refugees were not for the most part “forced out of their homes” but in many cases were urged to leave by the five Arab armies which instigated a war Knell does not apparently find it necessary to even mention. She neglects to inform audiences that PA recognition of Israel as the Jewish state in no way presents any kind of threat to the rights of Arab Israelis and she fails to make clear the ‘end game’ of the Palestinian demand for ‘right of return’ of refugees. Besides erroneously presenting the BDS movement as “supporters of the Palestinians” rather than a politically motivated campaign to delegitimise and dismantle Israel, Knell mainstreams the so-called “cultural boycott”, promotes the partisan narrative of “Palestinian land” and fails to inform listeners of the existence of alternative views regarding “international law”, in clear breach of BBC editorial guidelines on accuracy and impartiality. Not for the first time by any means we see Yolande Knell acting as a mouthpiece for unadulterated amplification of the PA narrative in this radio interview. The type of terminology she chooses to use, her presentation of a morally equivalent view of terrorism and her mainstreaming of BDS are part and parcel of the promotion of that narrative. Notably too, this interview joins numerous other BBC reports in failing to even try to clarify to BBC audiences the rationale behind the Israeli demand for recognition of Israel as the Jewish state and why the issue of that Palestinian – and wider Arab – recognition is crucial to the success of any agreement. With the negotiations having reached such a critical point, it is vital that the BBC adhere to its public purposes and begin clarifying that issue to audiences.